I'd always managed to stay out of Faerie. My life was almost perfect, if a little lonely. Now, I'm forced to tangle with an annoying dragon. Since meeting him, my life has turned upside down. I'm trekking through Faerie, where trees and rocks want to feast on my bones. I prefer not to kill anyone. Too bad my magic doesn't feel the same way. I’m Sophie Morrigan. Yes, The Morrigan is my mother, and no, I won’t turn into a giant crow and eat you alive. I’ve rejected my estranged mother’s legacy in exchange for a career retrieving dangerous magical objects and locking them up for safe keeping. My life was almost perfect, if a little lonely. Then I lost control and almost killed someone with my death magic. Oops. That's when I was forced to tangle with an unbelievably annoying, and hot, dragon—who happens to hold the key to my problem. Since meeting him, my whole life has turned upside down. I'm trekking through Faerie, where birds, trees, and even rocks want to feast on my bones. I swear, if I get out of this place alive, I'm totally going to kiss him—kill him, I meant kill. 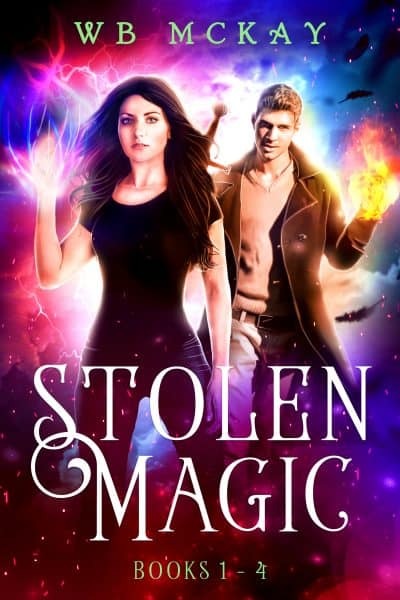 This collection includes the first four books in the Stolen Magic series: Bound by Faerie, Reaped from Faerie, Hidden by Faerie, and Immersed in Faerie. They follow Sophie as the world she knows falls apart and she struggles to guard her heart.